Are restaurants and bars in New York City too loud? For several decades, there has been a significant need to better educate the public about noise pollution, and over the past few years, an increasing number of media articles have claimed that eating and drinking venues are getting too loud. This loudness problem is likely due, in part, to background music or architectural design that enhances rather than abates interior sounds. These design elements include open kitchens, stripped-down or hard surfaces as well as less tablecloths, carpeting and paneling to absorb sound. Loud environments make it more difficult for people to connect with others in conversation as noise is the second highest complaint among diners in Zagat’s Annual Survey. In New York City, noise is the highest complaint and 72% of diners surveyed actively avoid eateries that are too loud [1-2]. Loud noise also potentially negatively impacts hearing health as it is the most common modifiable environmental cause of hearing loss that affects 24% of adults . The Center for Disease Control and Prevention recommends avoiding prolonged exposure to loud environments to prevent noise-induced hearing loss [4-5]. This is the first exploratory study to capture, on a large scale and on a continuing basis, the average sound levels of restaurants and bars. The free iOS SoundPrint app (links here to website and app) was employed to measure and submit the sound levels of New York City venues to its publicly accessible database. More than 1,800 Manhattan restaurants and bars were measured at least three times during prime-time days and hours (Wednesday through Saturday evenings between ~7:00PM-9:00PM) from July 2015 to June 2017. The measured sound level values are organized into four categories: Quiet, Moderate, Loud and Very Loud based on two dimensions – whether they are conducive for conversation and whether they are safe for hearing health. More discussion on how these categories were selected and defined is provided in the full paper. 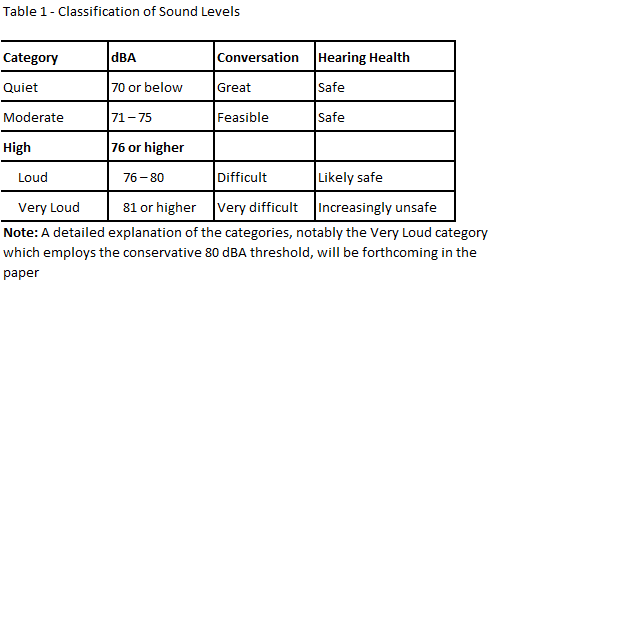 The results in Table 2 and Table 3 show that the average sound level for Manhattan restaurants is 78 dBA making restaurants, on average, too loud for conversation. For bars, the average sound level is 81 dBA making bars not only too loud for conversation, but also potentially unsafe for hearing health. About 71% of restaurants and 90% of bars that were measured exhibit sound levels that are not conducive for conversation. And approximately 31% of restaurants and 60% of bars have measured sound levels that are potentially dangerous to hearing health. 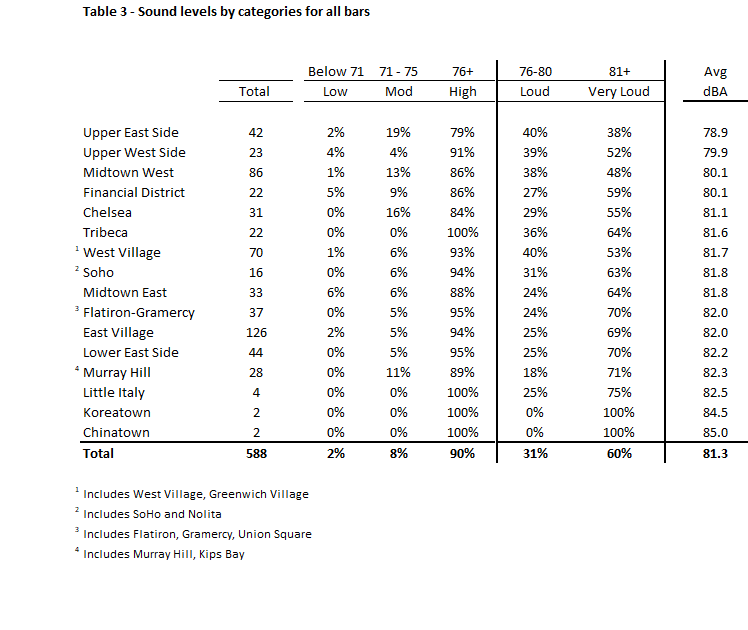 These numbers reach as high as 70% for specific Manhattan neighborhoods such as Flatiron, Gramercy, East Village and the Lower East Side where average measured sound levels are as high as 82 dBA. 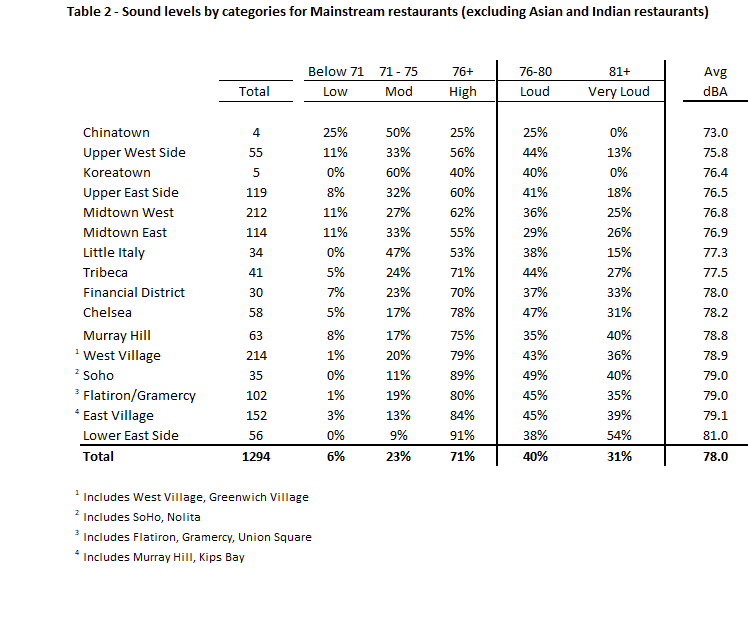 Segmentation by neighborhoods shows another story, notably that as one proceeds from uptown to downtown Manhattan, the restaurants and bars tend to increase in average sound levels so you are more likely to discover a quieter venue on the Upper West Side or Upper East Side than in the village (See Table 2 and Table 3). 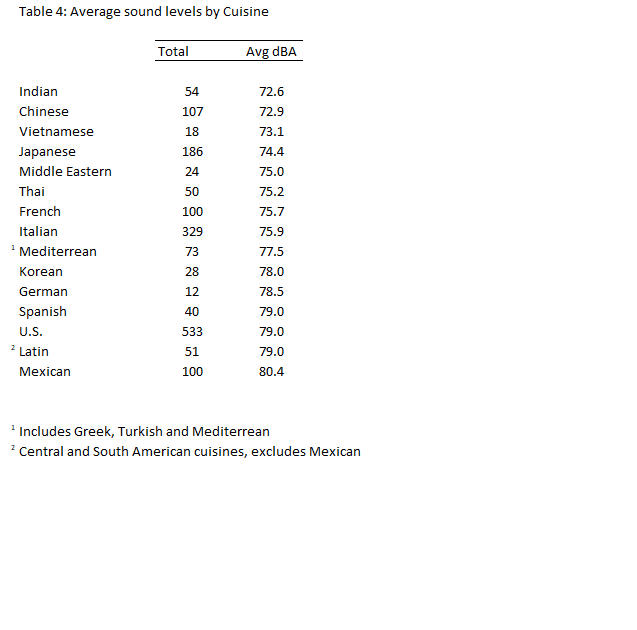 In addition, segmenting restaurants by their cuisine type shows a varying range of average sound levels where Indian, Chinese and Japanese restaurants comprise the relatively quieter restaurants compared to Mexican, Latin, American, Spanish and Mediterrean restaurants. SoundPrint data collectors observed that the quieter restaurants tend to have less background music, more sound-absorbing features and that the patrons do not tend to raise their voices compared to those of the other restaurant cuisines (See Table 4). Zagat Survey. The State of American Dining in 2016. James M. New York City restaurant survey pet peeves and dining stats; 2013. Carroll YI, Eichwald J, Scinicariello F, et al. Vital Signs: Noise-Induced Hearing Loss Among Adults — United States 2011–2012. MMWR Morb Mortal Wkly Rep. ePub: 7 February 2017.